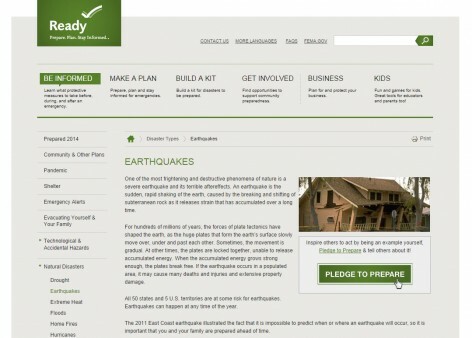 Why is earthquake preparedness important in Utah? Utah has experienced damaging earthquakes in the past and geologic evidence indicates that earthquakes larger than any experienced locally in historical time are likely in the future. 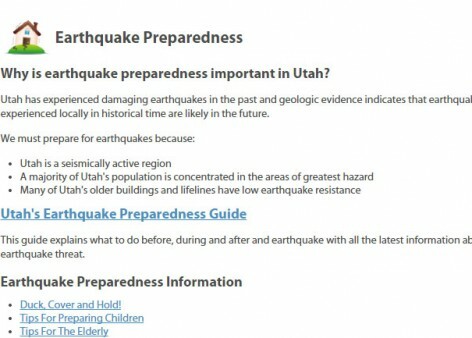 This guide explains what to do before, during and after and earthquake with all the latest information about Utah’s earthquake threat. While California has been the state most prone to serious earthquakes in recent years, there are many other fault zones in other areas of the United States. For example, geologists and seismologists have predicted a 97 percent chance of a major earthquake in the New Madrid seismic zone of the central United States (including Arkansas, Missouri, Tennessee, and Kentucky) between now and the year 2035. While earthquakes with the power of the one that hit the greater Los Angeles area in January 1994 are fairly rare, less severe earthquakes can interrupt your normal living patterns and cause substantial injury. During a major earthquake, you may hear a roaring or rumbling sound that gradually grows louder. You may feel a rolling sensation that starts out gently and, within a second or two, grows violent. You may first be jarred by a violent jolt. A second or two later, you may feel shaking and find it difficult to stand up or move from one room to another. The real key to surviving an earthquake and reducing your risk of injury lies in planning, preparing, and practicing what you and your family will do if it happens. 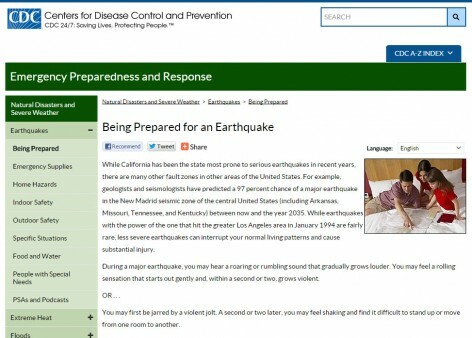 By planning and practicing what to do if an earthquake strikes, you and your family can learn to react correctly and automatically when the shaking begins. During an earthquake, most deaths and injuries are caused by collapsing building materials and heavy falling objects, such as bookcases, cabinets, and heating units. Learn the safe spots in each room of your home. If you have children, get the entire family to practice going to these locations. Participating in an earthquake drill will help children understand what to do in case you are not with them during an earthquake. Make sure you and your child also understand the school’s emergency procedures for disasters. This will help you coordinate where, when, and how to reunite with your child after an earthquake. DROP down onto your hands and knees before the earthquake would knock you down. This position protects you from falling but still allows you to move if necessary. COVER your head and neck (and your entire body if possible) under the shelter of a sturdy table or desk. If there is no shelter nearby, get down near an interior wall or next to low-lying furniture that won’t fall on you, and cover your head and neck with your arms and hands. Try to stay clear of windows or glass that could shatter or objects that could fall on you. If an earthquake occurs, you may need to evacuate a damaged area afterward. By planning and practicing for evacuation, you will be better prepared to respond appropriately and efficiently to signs of danger or to directions by civil authorities. 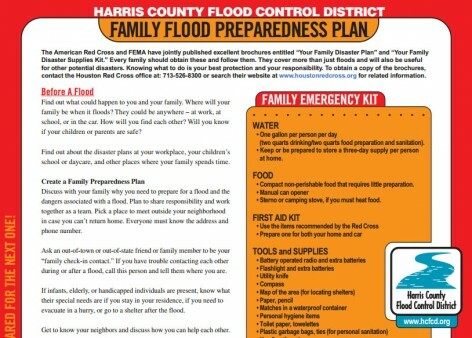 Take a few minutes with your family to discuss a home evacuation plan. Sketch a floor plan of your home; walk through each room and discuss evacuation details. Plan a second way to exit from each room or area, if possible. If you need special equipment, such as a rope ladder, mark where it is located. Mark where your emergency food, water, first aid kits, and fire extinguishers are located. Mark where the utility switches or valves are located so that they can be turned off, if possible. Indicate the location of your family’s emergency outdoor meeting place. things to do if time permits, such as locking doors and windows, turning off the utilities, etc. important medical information, such as allergies, regular medications, etc. the vehicle identification number, year, model, and license number of your automobile, boat, RV, etc. Stock up now on emergency supplies that can be used after an earthquake. These supplies should include a first aid kit, survival kits for the home, automobile, and workplace, and emergency water and food. Store enough supplies to last at least 3 days. The 2011 East Coast earthquake illustrated the fact that it is impossible to predict when or where an earthquake will occur, so it is important that you and your family are prepared ahead of time. This entry was posted in Flood, Natural Disasters and tagged videos. Bookmark the permalink. Every effort should be made to limit contact with flood water due to potentially elevated levels of contamination associated with raw sewage and other hazardous substances. 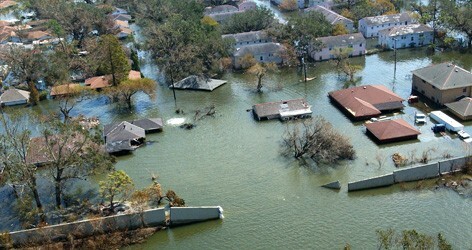 EPA and HHS recognize that Hurricane Katrina has caused extraordinary circumstances and that people may not currently have access to clean water, vaccinations, doctors, or disinfecting soap. EPA and HHS encourage people in these extraordinary circumstances to adhere to the above guidelines as closely as is possible to limit exposure to possible water contaminants. The public and emergency response personnel should follow guidelines from federal, state and local health and safety professionals. 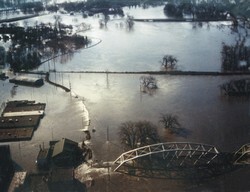 Early symptoms from exposure to contaminated flood water may include upset stomach, intestinal problems, headache and other flu-like discomfort. Anyone experiencing these and any other problems should immediately seek medical attention. General precautions to reduce contact with contaminated flood include routine washing with soap, and not eating or drinking while in contact with flood water. These precautions can significantly help reduce potential exposure and illness. Anyone with open-wounds or pre-existing conditions should seek immediate consultation to prevent possible illness. 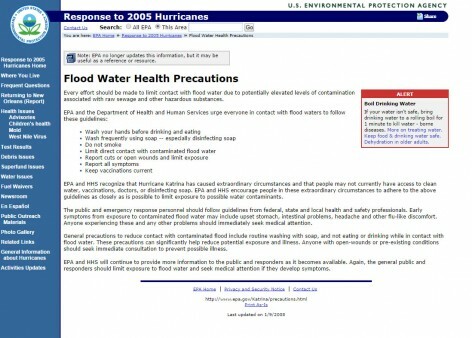 EPA and HHS will continue to provide more information to the public and responders as it becomes available. Again, the general public and responders should limit exposure to flood water and seek medical attention if they develop symptoms. Be aware of flood hazards no matter where you live, but especially if you live in a low-lying area, near water or downstream from a dam. Even very small streams, gullies, creeks, culverts, dry streambeds, or low-lying ground that appear harmless in dry weather can flood. Every state is at risk from this hazard. Floods, big or small, can have devastating effects on your home and your family. You can take steps to reduce the harm caused by flooding. Learn how to prepare for a flood, stay safe during a flood, and protect your health when you return home after a flood. 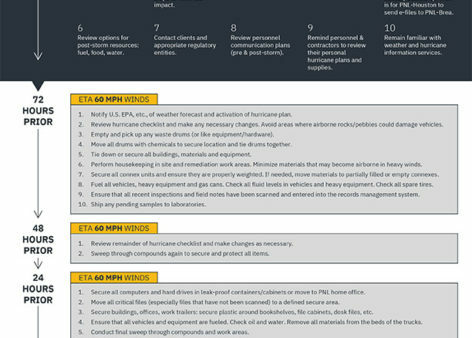 FEMA Flood Hazard Maps: Information on locating Flood Insurance Rate Maps (FIRM), understand how to read them, and requesting a map change. Keep a battery-powered radio tuned to a local station. Follow all emergency instructions. If you are caught in your building by rapidly rising waters, call 911 for help. Then move to a higher floor or to the roof. Take warm, weatherproof clothing, a flashlight, a cell phone and a portable radio. Do not walk or wade in flooded areas. Be prepared to evacuate. If advised to evacuate, do so immediately. Evacuation is much simpler and safer before flood waters become too deep for ordinary vehicles to drive through. If you evacuate by car, do not drive where water is over the road or past barricaded road signs. Before re-entering your home, check for structural damage that could cause the building to collapse. Be cautious of potential gas leaks, electrical shorts and live wires. When re-entering a building, use flashlights, rather than lanterns or candles (in case of gas leaks). Have a professional check your heating system, electrical panel, outlets and appliances for safety before using. Call the gas company to have them turn the gas back on. Follow disaster preparedness procedures when cleaning a house after a flood. Document your losses. Photograph damages and record repair costs. Remove and empty sandbags. Do not dump sand into the river or on its banks. Store it for future use. Apply for financial assistance. 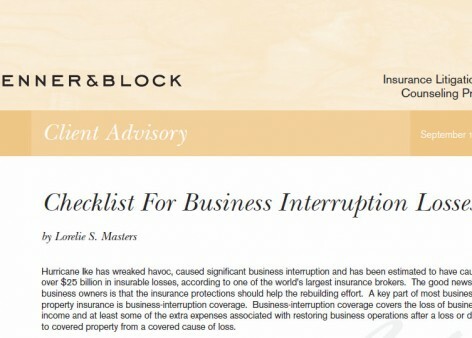 Only available following a federal disaster declaration. Listen to the radio or television for updates on disaster assistance and registration procedures. This entry was posted in Hurricane, Natural Disasters and tagged videos. Bookmark the permalink. The following tips are republished from a press release issued by the Massachusetts Emergency Management Agency (MEMA) on July 6, 2007. For more information about this press release or about MEMA please contact Peter Judge at 508-820-2002. Framingham, MA – As we enter the 2006 Hurricane Season, which experts are predicting to be very active, the Massachusetts Emergency Management Agency (MEMA) is offering personal preparedness tips for the all of the citizens of the Commonwealth. Every household should have a supply of canned goods and other non-perishable foods that do not need cooking, along with bottled water, extra prescription medication, and extra food and supplies for infants and pets. A manual can opener and a basic first aid kit are also essential. The Massachusetts Emergency Management Agency (MEMA) is the state agency responsible for coordinating federal, state, local, voluntary and private resources during emergencies and disasters in the Commonwealth of Massachusetts. MEMA provides leadership to: develop plans for effective response to all hazards, disasters or threats; train emergency personnel to protect the public; provide information to the citizenry; and assist individuals, families, businesses and communities to mitigate against, prepare for, and respond to and recover from emergencies, both natural and man made. 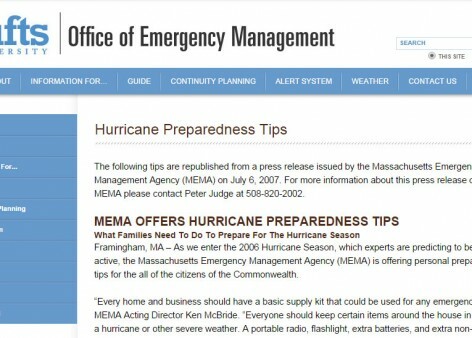 For additional information about MEMA and Hurricane Preparedness Month, go to www.mass.gov/mema. Develop a ‘Family Emergency Communication Plan’ in case family members are separated from one another during an emergency (a real possibility during the day when adults are at work or traveling and children are at school, camp or a friend’s home). You can then develop a have a plan for safely getting back together. This will help assure everyone that all family members are safe. Ask an out-of-state relative or friend to serve as the ‘family contact’. After a disaster, it is often easier to call long distance than locally. Make sure everyone knows the name, address and telephone number of the contact person.